Help kids learn while encouraging imaginative play. They will have a blast filling their logs with with colorful acorns. Unique to games made by Educational Insights is a game board that is part of the bottom of the box. This keeps the components from getting lost and helps thin game board from becoming bent or destroyed. 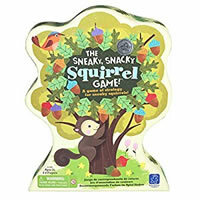 The Sneaky Snacky Squirrel is a fun colorful themed game that kids will play over and over again. Great as a gift or an activity for kids to play together. Learning how to play is very quick and easy. Tell us what you think about The Sneaky Snacky Squirrel below by leaving us a comment. Buy this game for the kids today! If you can fill your log first then you win! Included is a colorful tree-shaped game board, 1 squirrel squeezer, 20 colored acorns, 1 game spinner, 4 logs and the official The Sneaky Snacky Squirrel game rules and instructions. Please keep in mind that the official The Sneaky Snacky Squirrel childrens rules and instructions could be different depending on the game version you have. The rules below are some of the exact directions on how to play The Sneaky Snacky Squirrel. Share with us your comments, funny stories, tips, advice, strategies, creative ways to play, questions about how to play, problems with the rules or anything you want about The Sneaky Snacky Squirrel. All submissions will be reviewed within 24 hours. Click here to add your The Sneaky Snacky Squirrel comments.